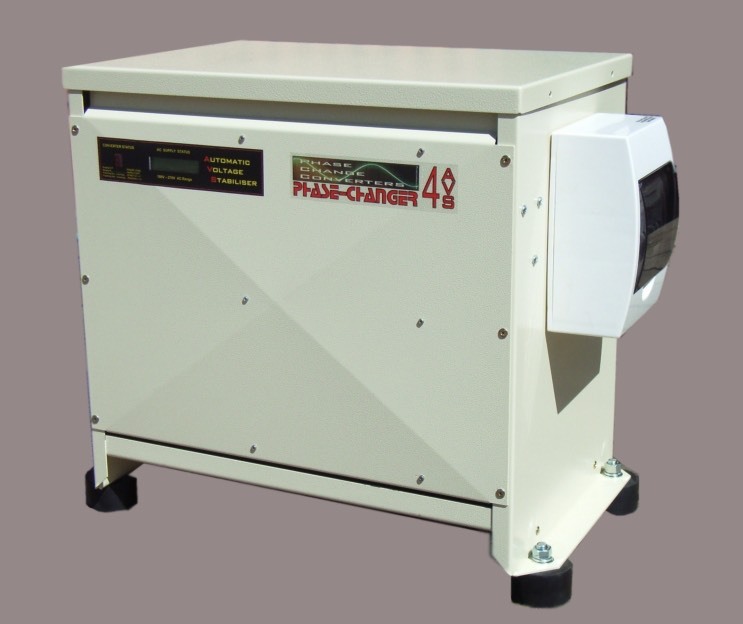 Originally developed for parts of Asia where single phase infrastructure is far from ideal, the AVS Phase Changer adds a unique voltage stabilised to the front end of the converter allowing it to operate on single phase all the way down to 100V and upto 268V while still providing 415V three phase output. 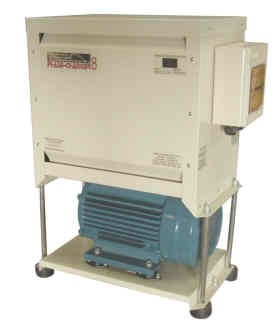 For years now Phase Change Converters have been manufacturing a power converter system that takes common Single Phase Power to convert into Three Phase Power for running any kind of 3 Phase machinery up to 37kW. For our standard converter range you needed a stable AC supply between 200-250V to achieve this. Now for remote areas where AC power quality is poor we can offer an ‘Automatic Voltage Stabilised’ (AVS) addition to the normal range of converter products that will produce quality 380-415V Three-Phase power for machinery up to 8KW, all from supplies that drop to as low as 100V. This system will not manufacture new power, so the energy you use cannot exceed the energy available, but it will get the most out of your existing power resources and permit use of machinery that you could not normally run. The standard converter is fitted with a special Automatic Voltage Stabiliser module and a multi-tap power transformer which constantly measures the AC supply and quickly adjusts internal settings to compensate for local power conditions. Unlike other common voltage stabiliser systems it can react very fast to voltage changes and will not wear out quickly with rapid voltage shifts. It is designed to be used with high start-energy motor loads and can briefly enter a special Boost Mode to assist converter output when large motor loads are first connected. A row of LED indicators on the side of the Voltage Stabilised converters informs the operator of the present power supply conditions. · The yellow Ready indicator shows that the converter is successfully tracking the AC supply. · The Motor Boost indicator shows when a large motor load has been detected which requires a brief voltage boost to get it started. Once the load has been started the green Normal indicator will glow to signal normal tracking operation. · Four Voltage Indicator led’s show the present operating range of the voltage. These indicators will frequently change with shifts in AC voltage and variations in customer loads. There are two types of low voltage problems experienced in workshops and homes. One example is where the power wiring to the customer is of reasonable quality, but the actual voltage being supplied by the power company is either low or high. In this situation the Automatic Voltage Stabiliser feature will lock on to this level without needing to vary its setting often and equipment used on the converter will operate normally. If not required, the Boost feature can be turned off. Another common situation is where the voltage supplied to the customer is high, say 220-240V when very little electrical equipment is being used, but the voltage drops by a large amount when loads are connected. This problem is mostly caused by long power cable runs of small cable size leading to the customer location. The Automatic Voltage Stabiliser feature will track this condition down to as low as 120V. Should the voltage dip below 100V, the Voltage Stabiliser will decide that there is simply not enough energy available to run the converter and enter a special ‘lockout mode’. If this happens the converter unit will slowly beep four times and try again to service the load. After three successive failed attempts to operate a customer load, the converter will remain in this Lockout mode indefinitely, or until power is manually turned off and back on again by an operator. There are many remote installations incapable of solving power problems using conventional Voltage Stabiliser equipment. This AVS system, fully integrated with Australian Power Converter technology will provide genuine 3 Phase power from locations where wide power line variations are common.